I really like your description of how working in a series is turning out to be for you – the analogy to meandering through a place as you explore sounds exactly right to me. Adventure, your own pace, discoveries and surprises along the way, doubling back ... all sorts of wandering and travel metaphors apply, don’t they? But however one describes it, it’s obvious from the work you’ve been doing that your adventure is doing you good and taking you to some wonderfully interesting places. 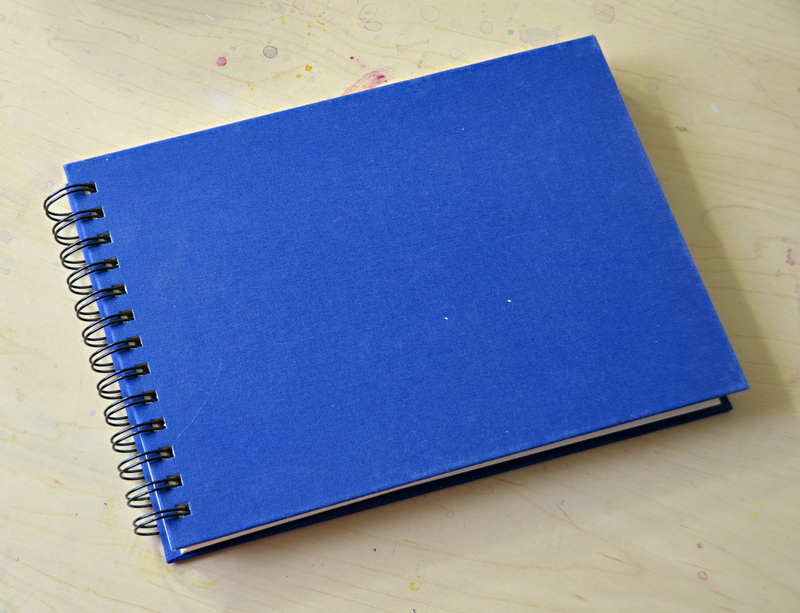 As for your sketchbook experiments, well I have to say that I think you have proven my point as to their usefulness. 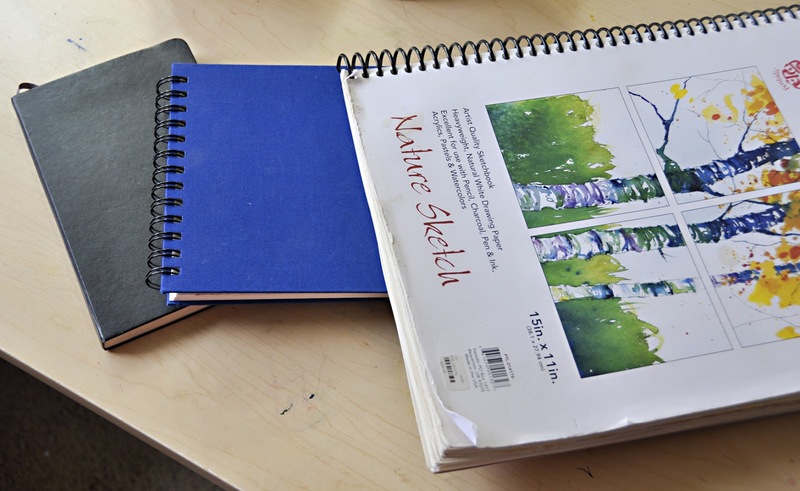 It looks like you started out thinking that a sketchbook had to be about SKETCHing, and that process – trying and changing and adapting and disguising – led you to a discovery that is useful to you. Unless your goal is to make a pretty book with pretty pictures, then I think you’ve been extremely successful. It wasn’t the pages themselves that were the art, it was the process of doing them that feeds your art. That’s my thinking, anyway. It’s about the process. 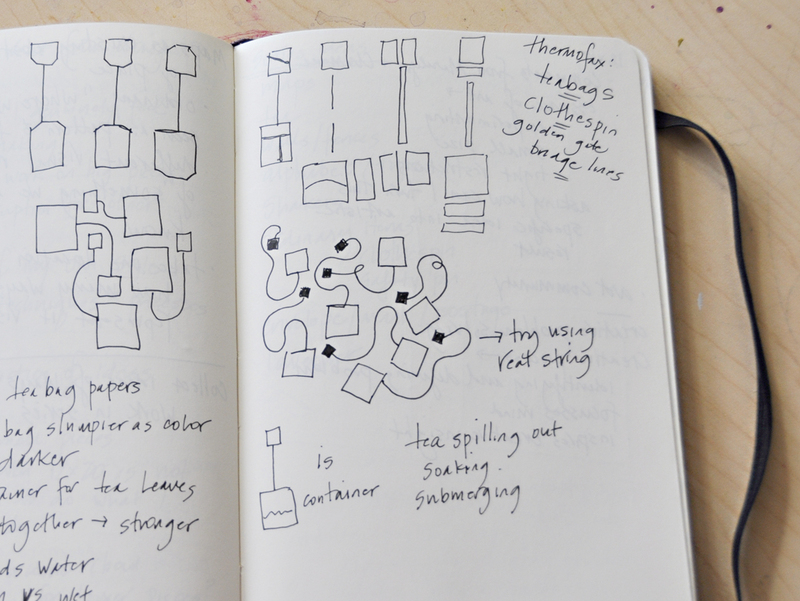 You know how fascinating it is to look at other people’s sketchbooks? Even the doodly, scribbly ones? One of the things that I love about that – aside from the endlessly fascinating details of how they keep their sketchbooks, what books they use, do they draw, write, etc – is that you get a glimpse of sorts into the artist’s thought process. Remember when we went to the pottery festival when I visited you? One of the many nice memories I have of that day is of standing at a potter’s booth and looking at the sketchbooks she had on display. Her pots were decorated with these delightful simple yet evocative drawings ... and her sketchbooks were full of tiny pen and ink sketches and doodles that clearly showed her working out the designs for her pottery. But a messy book is as fascinating, if not more, than a tidy one, don’t you think? It’s that sense of mystery and reality – because we know the creative process isn’t a linear, neat one. It’s a messy thing. 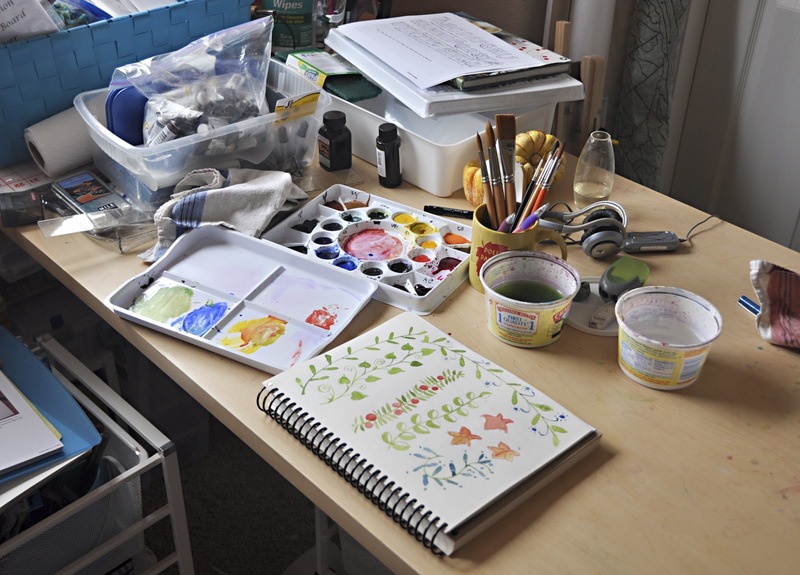 Or maybe I should speak for myself here – I am reassured by seeing a messy sketchbook because it reassures me that I can be messy too. I can get caught up in the belief that my sketchbook has to look nice and pretty. I’m getting a lot better about not worrying about that. 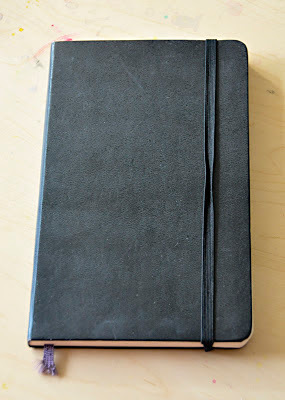 One of the books I like using the most is the plain old black Moleskine, one of those 5x7 ones with lighter weight smooth drawing paper inside. You know the ones. I think it's been good for me -- freeing -- to just NOT worry about how it looks. And you know, when I pick it up after not using it for a bit, it always looks better than I think it will. Would you like to see some of the others I have going? Of course you would. You and I both love this sort of thing. 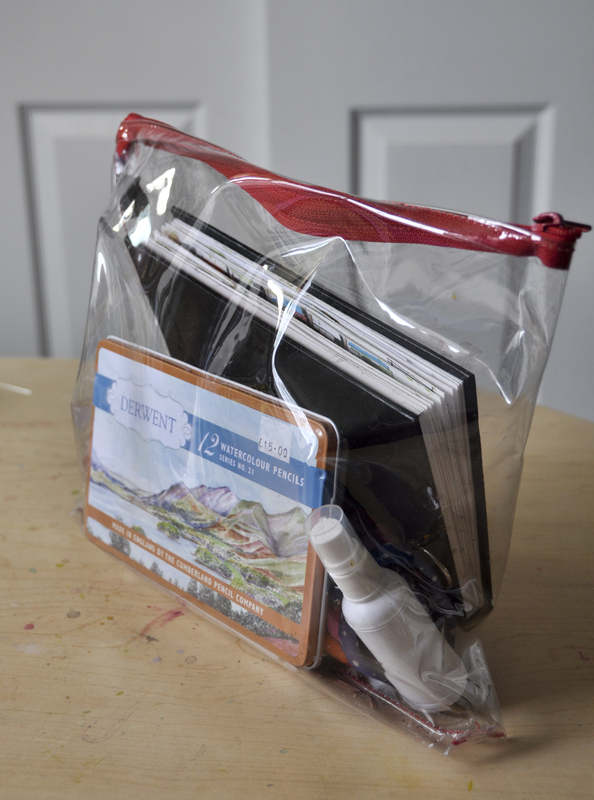 Well, here's one of the painting-play books I have going. 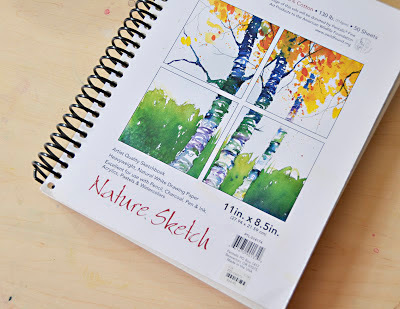 It's 8.5 by 11 inches, by Pentalic, in their "Nature Sketch" line. It has good, heavy (130 lb) paper with good texture for drawing or watercolors. 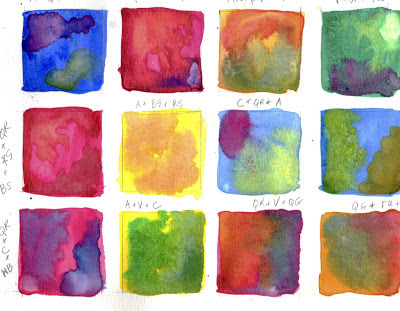 I'm currently using this for an online class I just started in watercolor lettering. (Paints and typography! A perfect combination!) 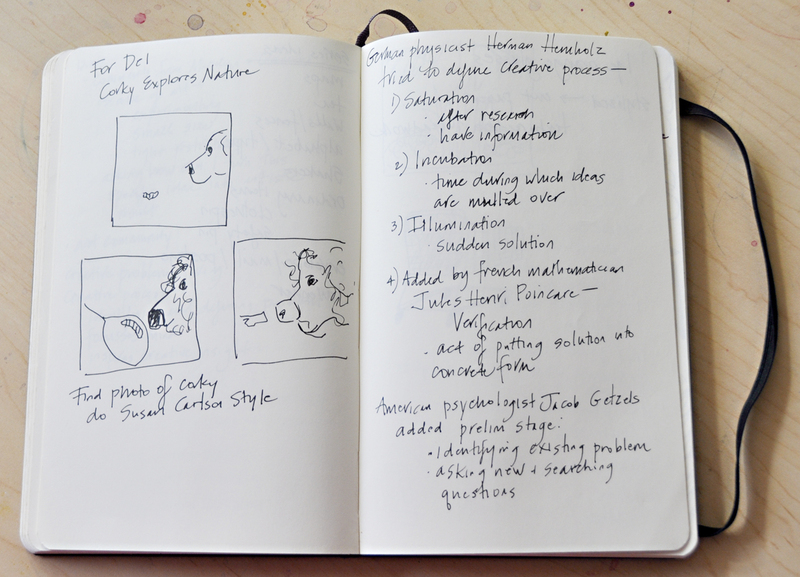 I like using it for the exercises because the paper doesn't feel precious -- it's just good drawing paper. Here's an exercise we did for the first week -- the task was to modify block letters, and paint in the negative space by dropping in color and letting them blend. Very fun. And if you'd asked me before I started using it, I would have said it was too big. But I bought it for a class with Jane LaFazio a year ago, and I've found that I like working that big. I've surprised myself at how easy it is to fill up that size of page, either with a big image or with several vignettes. 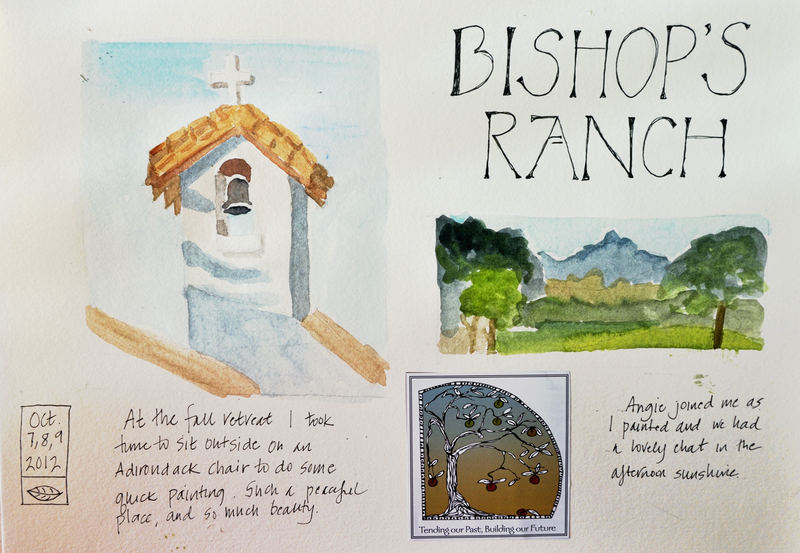 By the way, I don't think I showed you one of the pages I did when I was at the ranch retreat last October. I actually did the two paintings when I was sitting in an adirondack chair out on the lawn near the chapel. Plein Aire, as the painter types say. Because I'm pretty new to this painting thing, I'm trying to just relax and enjoy it, and to keep practicing without worrying what book it's in, will it be perfect, does the book have a pretty cover, etc. Somehow each book has a purpose and it's working for me. Which leads me to my portable art kit. 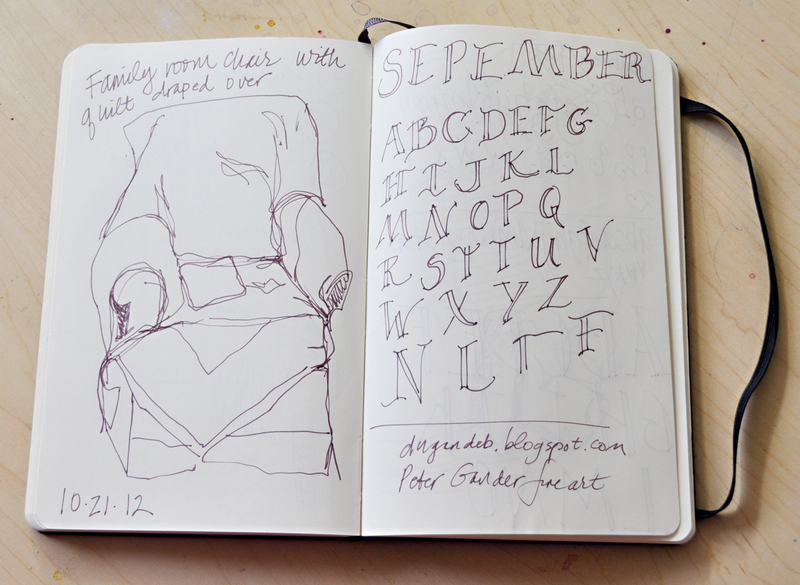 I really like your idea of the Art Filofax and am eager to give it a try one of these days. But here's what I've been using so far. 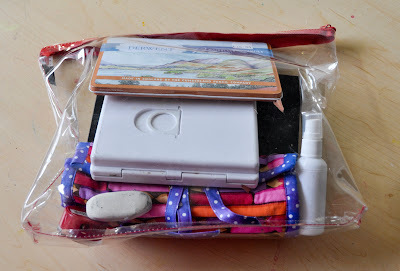 The plastic pouch is an 11x13 project bag from The Cotton Patch quilt shop in Lafayette (remember when we went there after that traffic-laden freeway drive, on the first day we met in person?) I love those project bags, they are so useful. It's perfect for throwing the whole kit into my basket when I head out the door. My Stillman & Birn painting/sketchbook (oops, there's another one -- it's 5x7 with 140 lb watercolor paper and I like it because it is bound, so you can paint one scene on a two-page spread); a small tin of Derwent watercolor pencils (from the Keswick Pencil Factory, of course); a small Koi watercolor kit; a small spray bottle of water for moistening the pan paints, and my pen roll. 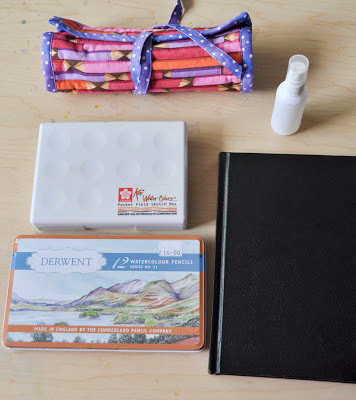 By the way, it makes me very happy to carry that pencil tin and remember that very fun pencil factory visit. 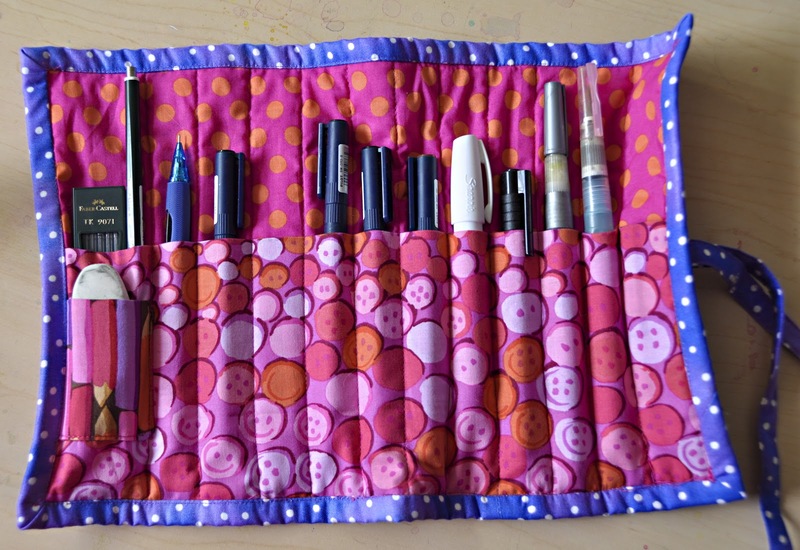 I made the pen roll after seeing something similar and then modifying it to suit my needs. It holds a few mechanical pencils, some black Pitt artist pens with permanent ink, a white ink pen, and two water brushes which are the best invention ever. Which leads me to what I've been doing. No fiber art working going on here lately, but that's okay. 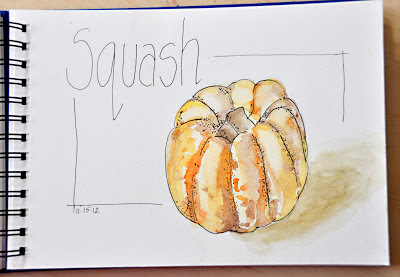 I've been taking snatches of time to play with the watercolor paints when I can. You know that I have that one worktable in my little studio/office, yes? Here's what it looks like right this minute. 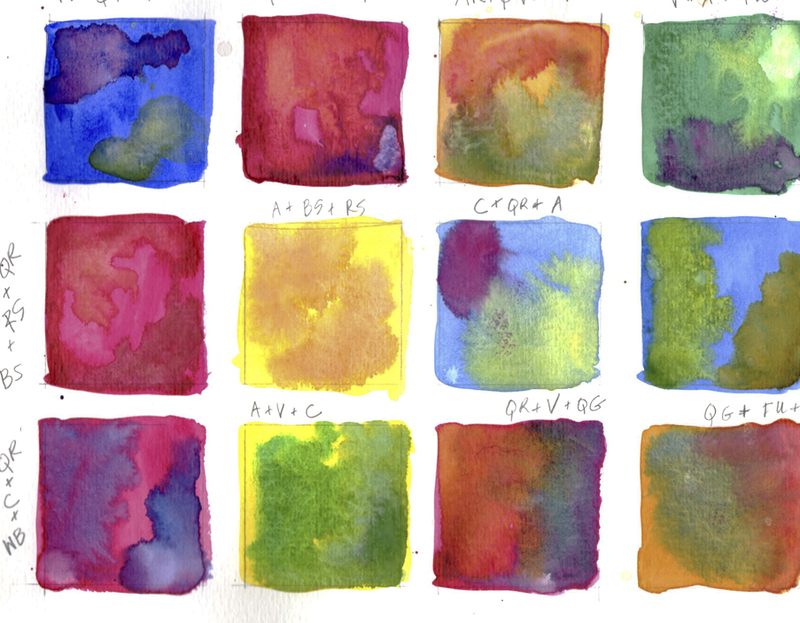 The paints are out, and you can see a page of painted borders I was working on yesterday for an exercise in the watercolor lettering class. When I started the class, I wouldn't have thought I could do that sort of thing. So this drawing and painting process has been good for me in a lot of ways. I didn't used to think I could draw, or paint. And I'm learning, and now I realize that I can. 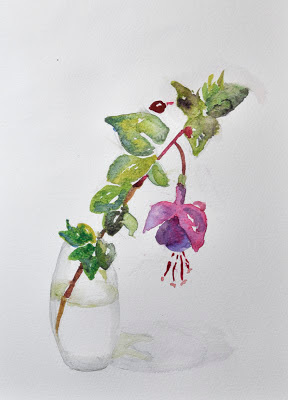 I've really come to realize that it's not about doing it perfectly, or like watercolors I see in books or galleries or online -- it's about ME doing it the way that feels good to me. And that's enough. 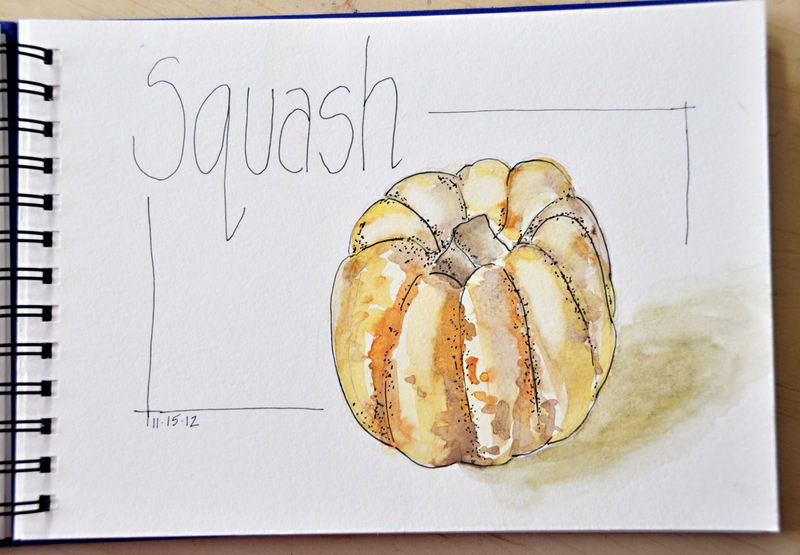 We've talked here (and others have commented) about learning to draw. And really, it's learning to SEE. I know you weren't that thrilled with the drawings you did. But my suggestion is to keep doing it anyway, a bit at a time. Make yourself do one little thing a week, even. You will get better. You need not to be afraid of it, and to accept that your drawing is YOUR drawing and that's what's powerful about it, even as it is evolving. 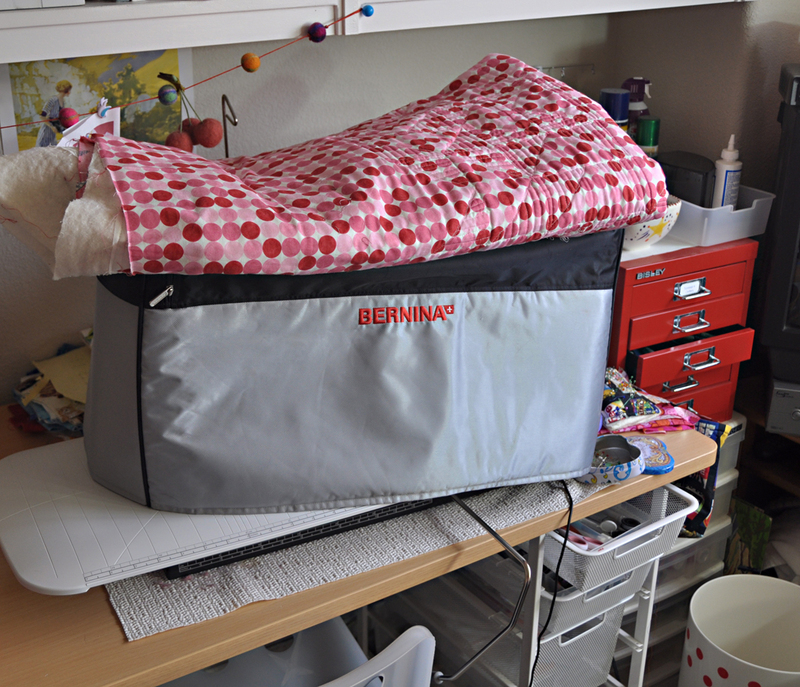 And I think it will end up informing the quilt art you do. There's my two cents on that subject. 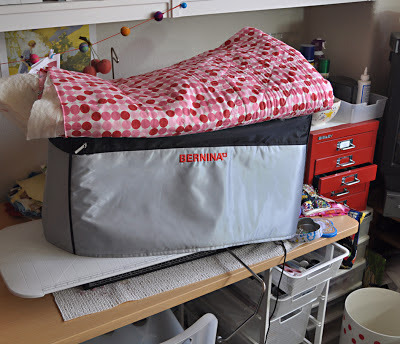 Here's what the sewing side of the room looks like, by the way -- no action, just a quilt in progress waiting for a bit of time. So I guess all of this is to say that I've meandered down a side street and I'm still meandering. 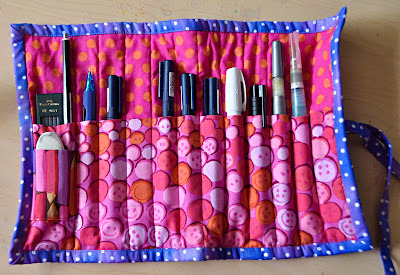 I need to meander back to my sewing machine soon, though, as our 12x12 group's "sweet" challenge is due soon! I'm meandering down a side alley myself. I don't know exactly how it will inform my main path, but I know that somehow, subconsciously, it will. Your painting experiments are looking good, and I see wonderful areas of improvement. You said," It wasn’t the pages themselves that were the art, it was the process of doing them that feeds your art," which i think is soooooo sooooooo important. I think that sketchbooks are travelogues of the journey and not the actual destination cities (to continue the travel analogy). All art is really about learning to SEE. And practice makes the hand and eye work unconsciously --the artful gesture. Each artist has their own signature way to add lines with pen or pencil and lay in a wash of color. 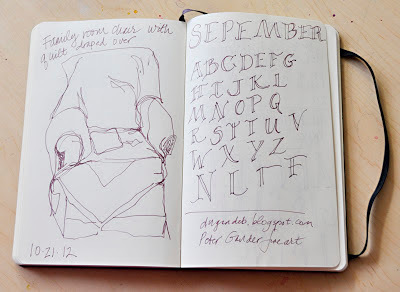 You still life is lovely and I am eager to try the negative space washes with lettering. Thank you for sharing!